I can almost feel the rain splashing in the way you wrote that, has a great rhythm! I’m sure that would make a very good spoken word with the right voice and a perfect music track with it. It rained all day today. I can hear the earth sigh with gratitude. As I do, because I left the hose alone all day. Yes, a little of your rain would be good! What are you doing up so late? I knew a new phone would be like candy to me and 6 am comes too soon! Good night and sweet dreams. I have sick kids and my sleep was thrown off. You can blog on your phone? How exciting! Congrats on your new phone. I had Little Miss here on a day after a heavy rain, but also during a light sputter, so she could in fact jump in the puddles on the driveway. May we continue to listen to nature with our whole hearts. Sounds fun, nothing like puddle-stomping! And (almost) 2 year old kiddies are the best at that! I like all your verbs! Perfect for a rain storm. Brenda, there were many parts of this poem that resonated with me. First of all, the last line is a reflective one with the addition of the word listen. The imagery is vivid and the photo looks like it was captured after the rain dropped. I have an online global gallery that I am designing called Spring’s Symphony. If you are interested in having this poem included please let me know. You can see the invitation at http://beyondliteracylink.blogspot.com/2015/05/may-blossom.html. Brenda, i don’t often look at Word Press replies so I apologize on the lateness of this response. I am ready to collect offerings for Spring’s Symphony Gallery. You can refer to the following posts for additional information and can send me questions at cvarsalona@gmail.com. http://beyondliteracylink.blogspot.com/2015/06/envisioning-springs-symphony.html and http://beyondliteracylink.blogspot.com/2015/05/digital-design.html. We had already exchanged emails on this subsequent to this comment. I cannot find that threaded conversation so that is why I wrote again. Do you need me to resend my email? I tried resending the email to you, but I received a message advising me that the message was blocked as spam. I’ve tried a couple more times. I hope you get one of them. Please let me know. I did receive your email, Brenda. Thanks. 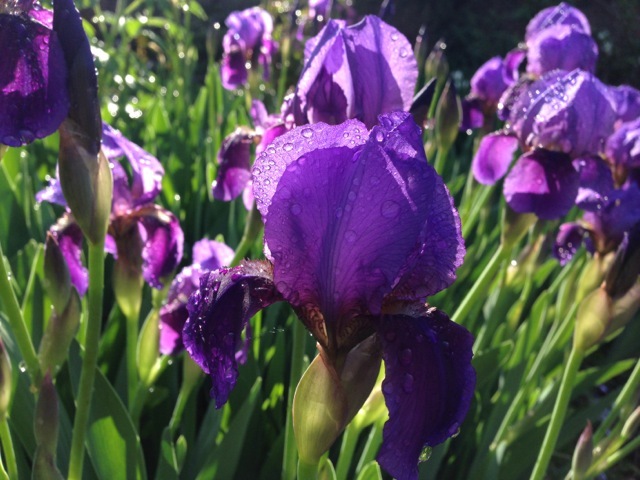 “Greens deepen/flowers glisten” Lovely imagery, Brenda! Enjoyed the concrete details and form! Thanks! We both shared one by Langston Hughes today. So joyous and rejuvenating! Love all those sensory details. I need my umbrella :). P.S. hope you get some rain soon . . .
I’m glad you liked it. I was longing for it, and longing often produces poetry. It’s funny that way. I totally like your spring rain crescendo. Funny, it is just raining the moment I’m reading your post. Perfect. LOL Oh, no! It was supposed to rain here, and it’s dry as bone. Thanks! Fingers crossed we get some rain soon. Very nice, Brenda! I like the way the length of the lines echoes the progress of the storm! Like the starting lines which looks like a song for children .